Over the past 15 months, at least 40,000 people said they were interested in attending anti-Trump rallies hosted by a group that Facebook banned last week, including a sing-along in front of the White House and a protest in Rome when the president was meeting with the pope last year, according to archived pages. The popularity of these events highlights a weakness in Facebook’s new mission to encourage users to join groups of like-minded individuals and meet up offline. “Resisters,” the group Facebook removed as part of a crackdown on inauthentic accounts ahead of the 2018 midterm election, organized at least 30 events, capitalizing on one of Facebook’s most powerful tools for political organizing. The use of events to spread disinformation and further polarize the public builds on a tactic used by Russian operatives around the 2016 election. Facebook stopped short of saying who was behind the 32 pages and accounts it removed last week, but some lawmakers and academics attributed it to Russia. [post_ads]Even as the 2018 midterm elections draw closer, Facebook does not appear to have increased its oversight of event listings the way it has done for posts and political ads -- other elements of the platform that have been co-opted by Russian forces seeking to stoke social and political unrest in the United States. Facebook has hired thousands of moderators and is building tools to review content. The company largely relies on existing group administrators to police those who join their groups and promote their events. Events generated or backed by inauthentic operators could become fodder for real-world confrontations with the "potential for violence," said Laura Rosenberger, the director of the Alliance for Security Democracy at the German Marshall Fund. The United States, she said, "has a highly polarized population that is very emotional about issues, and the Russians have figured out how to tap into that." “Security is an arms race. While we keep getting better, so do our adversaries, which is why we’ve come forward with what we know and are sharing information with law enforcement and other companies,” said Facebook spokesman Andy Stone. “This is a challenge that affects all of us.” He said that Facebook has increased scrutiny of event listings before big demonstrations, such as the upcoming far right rally Unite the Right rally in DC put together by the organizers of Charlottesville. It is unclear whether all of the events organized by Resisters took place -- or exactly who first created them. Suspected Russian agents worked side by side with legitimate liberal activists as co-administrators of the Resisters page. For some of their political events, they piggybacked on existing protests or enlisted the support of groups like MoveOn and Code Pink as co-hosts. Neither organization recalled interacting with anyone at Resisters. The fluidity with which Resisters appeared to comprehend the real-world organizing strategies of Americans and to take advantage of tools Facebook has built to galvanize groups shows a growing sophistication, said Renee Diresta, the policy lead at Data for Democracy, a group of technology researchers dedicated to promoting integrity online. The blurred lines between politics and propaganda also unnerved some lawmakers, who are set to question executives from Facebook, Google and Twitter about their efforts to safeguard online platforms at a September hearing. The number of people who checked a box saying they were “interested in attending” or had RSVP’d to show up at Resisters-linked events totaled 41,043 people, according to a tally by The Washington Post. At least 28,000 additional Facebook users received invites to attend the rallies and protests, the data show. The Digital Forensics Lab at the Atlantic Council, which received the data from Facebook, and Jonathan Albright, research director for the Tow Center for Digital Journalism at Columbia University, provided information and analysis for this story. “It’s vital that Facebook continue to proactively identify foreign actors engaged in manipulative behavior on their platforms, and to take the additional step of notifying users — not just the event organizers — who have been exposed to their content or expressed interest in attending an event,” said Rep. Adam Schiff, the top Democrat on the House Intelligence Committee. Events and groups receive less oversight than other parts of Facebook. Any individual or group on Facebook can host an event, which appears as a separate Facebook page with its own invitee list. The creator of an event can invite other individuals or groups to host it and send out invitations. In January, more than 4,000 Facebook users were invited to attend a rally outside the White House about Trump’s travel ban on majority-Muslim countries. 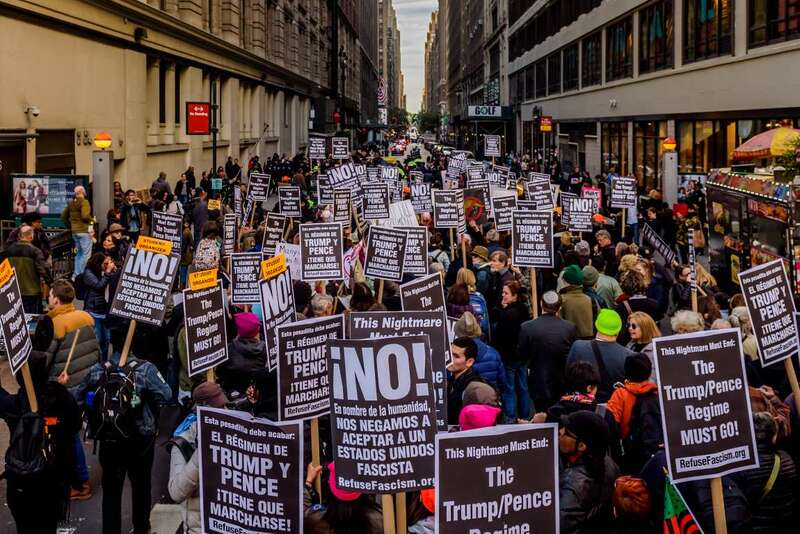 A total of 7,000 people were also invited to participate in two July 2017 protests in New York City and Washington D.C. against Trump’s proposed ban on transgender troops. In a September 21, 2017 Facebook post promoting a fall rally at Trump Tower, Resisters appealed to people disgusted by reports that Russia had spread disinformation on major social media platforms. 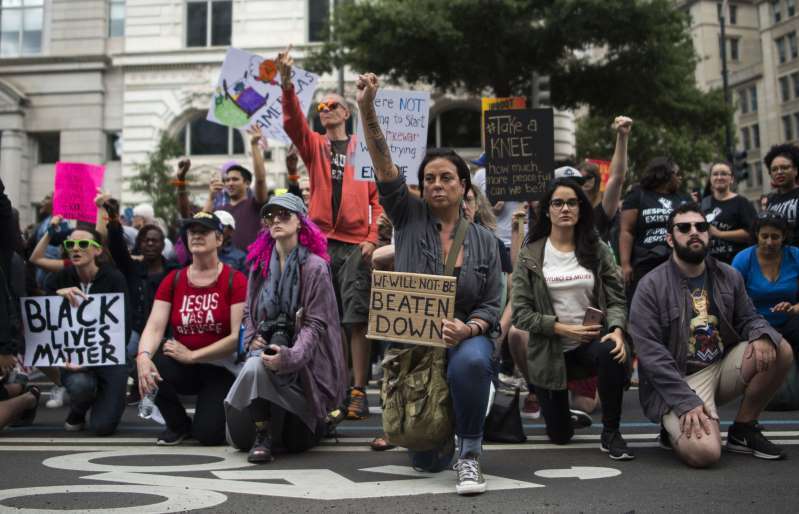 In its call to protest, Resisters cited a Facebook page that had been linked to the Kremlin’s online troll army, the Internet Research Agency, which was the subject of Special Counsel Robert Mueller’s indictment for election meddling earlier this year. Facebook said last week it found two links between Resisters and the IRA. In June 2017, Facebook CEO Mark Zuckerberg officially changed the mission statement of Facebook to emphasize how it could be used to facilitate real-life meetings and interactions. Instead of merely connecting the world and giving everyone a voice, Zuckerberg said, Facebook’s purpose would be to “build community and bring the world closer together.” He has set a goal of helping one billion people become part of Facebook groups within five years. “Online communities strengthen physical communities by helping people come together online as well as offline, even across great distances,” Zuckerberg said when he announced the new mission at the company’s first Communities Summit, a gathering Chicago for administrators of Facebook groups, such as addiction support communities and female biking clubs.